Stanford University’s business school has produced at least four self-made billionaires and 244 active chief executive officers, but Ross Pedersen, class of 2016, wakes up around 2 a.m. up to four days a week to clean toilets. Until early February, the 25-year-old was a vice president at Dallas-based hedge fund Verdad Advisers, where he says he helped pick securities to purchase and companies worthy of investment. He started the job in his last months at Stanford, part-time, then joined full-time about a week after graduation. Pedersen had around $55,000 of student loans to repay, and Verdad offered him an annual six-figure compensation package. But within a few months of starting, a desire to do public service started “eating away at me,” Pedersen says. Soon after, with his boss’s blessing, he took a yearlong leave to join the U.S. Army and prepare to become a national guardsman. Ross’s choice helps to explain why Stanford MBAs out-earn their peers. While he’s training in Fort Benning, Georgia, to become an infantry officer, many, if not most, of his former classmates are holding jobs, from consulting to private equity, that pull six figure salaries, some as much as $450,000 a year. At Stanford, which Bloomberg Businessweek ranks as the second best MBA program in the U.S., after Harvard, students are encouraged to pursue their passions rather than settle for traditional gigs. “We have a culture where you are encouraged to do whatever you want, to explore the things you want to do that others may think is crazy,” Pedersen says. At Stanford, past failures are celebrated, and students are known to skip reading assignments in favor of meetings with venture capitalists in the hope that their fledgling ideas may get funded. Highly ambitious students at other top-ranked business schools normally seek lucrative jobs in private equity and other well-paid sectors. At Stanford, those kinds of jobs generally elicit “snores” from fellow students, he says, because so-called gunners chase riskier ventures. Employers happily pay a little bit extra for the chance that their newly minted Stanford MBA will bring that attitude to their company. 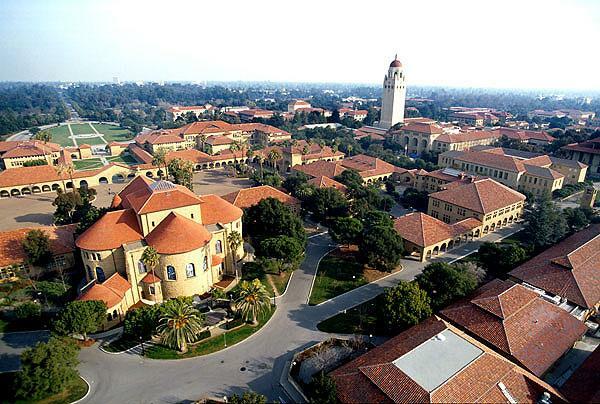 Stanford business school alumni receive the highest compensation one year out of school than other business school graduates, edging out Harvard and the University of Pennsylvania’s Wharton School of Business, Bloomberg Businessweek survey data show. Six to eight years out, the typical recent Stanford MBA earns $285,000, tied with Harvard for the highest earnings among MBA programs. Recruiters, school officials, former students and other MBAs say Stanford’s prestige, location in the high-cost San Francisco Bay Area, and proximity to Silicon Valley companies—Google’s and Facebook’s headquarters are less than seven miles away—all contribute to the generous pay. “It’s the sense that Stanford gets the absolute very best of the best,” says John Challenger, chief executive officer of Chicago outplacement company Challenger, Gray & Christmas. The school’s low admissions rate and relatively small class sizes also help boost alumni earnings, says Jay Bhatti, a New York-based venture capitalist, co-founder of BrandProject, and member of Wharton’s Class of 2002, in part because companies often trust that schools already have winnowed the pool of prospective hires. “The reality for MBA programs is that we have to rely on the admissions standards of the various schools to measure the level of quality,” says Michelle Bucaria, head of campus recruiting for JPMorgan Chase. Stanford admitted just 5.1 percent of applicants for its Class of 2018, just over half Harvard’s admission rate (9.6 percent) and slightly less than half of Wharton’s (12.7 percent), according to the schools’ websites. “When people go to recruit at Stanford, they recognize they’re getting candidates who probably got offers from Harvard and Wharton,” says Bhatti, who attended Wharton with Neel Kashkari, who leads the Federal Reserve Bank of Minneapolis, and Google CEO Sundar Pichai. There’s also the fact that so many alumni end up in and around San Francisco, Challenger says, where workers receive some of the highest wages in the country, thanks to the technology industry. Four of the 15 counties with the highest average adjusted gross incomes in the U.S. are in the San Francisco Bay Area, according to data maintained by the Transactional Records Access Clearinghouse at Syracuse University. Silicon Valley’s culture and Stanford’s apparent success in making that culture its own may be the biggest reasons that Stanford grads out-earn their peers. For example, students at Stanford are more likely to celebrate a classmate who previously launched a startup and then failed than one who completes all of their schoolwork, Pedersen says. Among top-50 MBA programs, Stanford has the highest rate of entrepreneurship, Bloomberg Businessweek survey data show. At the typical business school, some 3 percent of recent MBAs start a business upon graduation. At Stanford, it’s about 16 percent, a rate that’s held relatively steady over the last five years, says Maeve Richard, an assistant dean and director of the school’s career center. As a result, when JPMorgan, for example, wants to recruit MBAs with entrepreneurial talents, it turns to Stanford, says Bucaria. It’s unclear how long the school’s reputation will last. When the dot-com bubble burst, entrepreneurship rates among recent Stanford business school grads plummeted. “So long as Silicon Valley continues to shine brightly, Stanford grads are going to carry some of that sheen,” Challenger says. 0 responses on "The Value of a Stanford MBA"